The salty pistachios with sweet cranberries and cheese makes an amazing combination. In a small pan over medium-high heat, toast the pistachios until fragrant; about 3-5 minutes, stirring occasionally. Let cool. 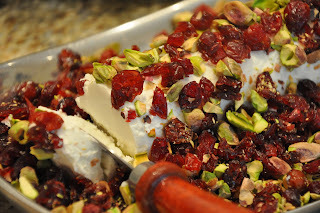 Combine the pistachios and cranberries in a plate and roll the goat cheese log in the mixture until completely coated. (Make sure the goat cheese is very cold before rolling it in the pistachio/cranberry mixture) Place on a serving dish and sprinkle the remaining pistachio/cranberry mixture around the log. Allow to sit out at room temperature for at least 15 minutes before serving so the cheese will soften nicely and become more spreadable. Serves approximately 6-8.
we had this on christmas eve, my mom made this exact goat cheese log elizabeth ann and it was DELISH! I adore this flavorful recipe. So bright and lovely. OOOOH! That looks wonderful, gonna have to try. Maybe NYE? Thoughts on the New Year. . .